Saturday. My dinner day of surprises. Sometimes I’ll come home and cook dinner. Other days, something wondrous and fabulous is awaiting me when I walk in the door. As I was leaving for work this morning I pulled some scallops out of the freezer to thaw. I didn’t have a plan but I knew there were any number of things I could do with them. 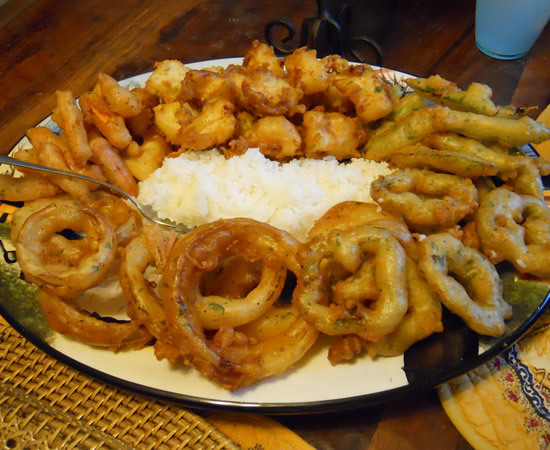 When I got home, I was greeted with Victor in the kitchen with a platter of vegetables, scallops, and the deep fryer. Three words: Beer Battered Tempura. Be still my heart! I was psyched. While I had a few ideas going through my head, tempura definitely was not one of them. I really was psyched! Victor is the tempura king. It was something he had on the menu at Montserrat when he owned the restaurant on South Street and he’s never lost his touch with it. It rocks. The batter is flour, salt, pepper, garlic powder, smoked paprika, finely chopped parsley – and beer. Proportions?!? Uh… Mix the flour with the dry spices and parsley and add beer until it’s the consistency of thin pancake batter. It’s roughly 1 cup flour to 1 cup beer but it’s not an exact science. The parsley really adds a nice sweetness. It’s not something I ever included when I made tempura batter. I really like it a lot. We had carrot sticks, peppers from the garden cut into rings. onion rings, snow peas, and the scallops. Everything was great – but the scallops were awesome! They were so moist and delicate they were like eating clouds. They seriously were some of the best scallops I’ve ever had. Victor floured them before dipping them in the tempura batter so it would stick better. And just about three minutes in the oil was perfect timing. My job was to make some dipping sauces. That was the easy part. The top sauce was honey-mustard. About a quarter-cup of honey and a heaping teaspoon of Strong Irish Mustard. I didn’t have any Chinese mustard but this stuff worked well. The sauce on the left was a lingonberry sauce. Lingonberry jam, soy sauce, a splash of rice wine and sambal oelek for heat. 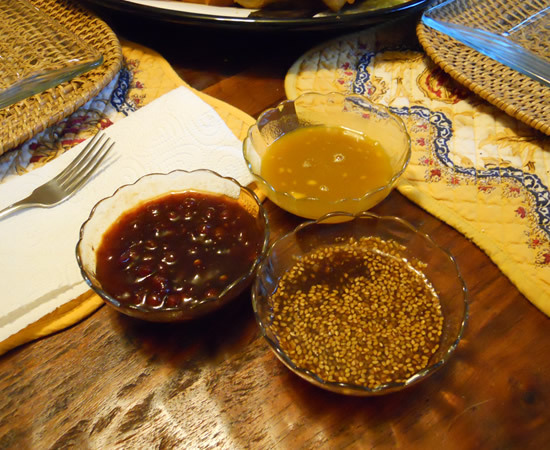 The sauce on the right was straight-from-the-bottle Soy Vey Very Teriyaki. All three worked well. It was just unbelievably good. And cherry-studded brownies just came out of the oven. This is definitely a good day! you guys know how to live. Scallops could be my favorite….i was trying to stay off of fb and get done some real life stuff—–now, you have me KNOWING what I will be buying to make monday……..